Browse our latest newsletters to keep up with new products, packaging ideas and more! To view our most current press releases and SKS's news features & sales, visit our promotions section by clicking here. SKS carries personal care jars and deli containers made from recycled PCR plastic and PIR plastic in a range of sizes with matching cap options to fit your sustainable packaging needs. In 2018 SKS expanded its online catalog by bringing in over 400 new bulk products and kits! Visit our new products page to browse the 2018 additions. Let's take a look at some of the new products SKS has to offer. SKS carries a variety of airless pump bottles and airless pumps for cosmetic packaging and beauty packaging. These travel size bottles are known for their sleek design and ability to protect sensitive products, such as natural skin care serums, foundations, and other preservative-free formula creams, from excessive exposure to air. SKS offers an expanding selection of cosmetic containers to package skin creams, liquid foundation, powdered makeup and more. Choose from glass or plastic cosmetic bottles and jars in a range of sizes to suit your beauty packaging needs. SKS Bottle carries a large selection of plastic and glass pharmaceutical bottles in a variety of shapes and sizes for housing products like vitamins, prescription medication, fish oil, and more. 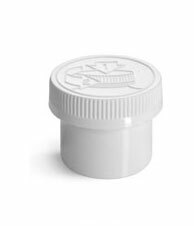 Many of our over the counter pharmaceutical containers can be paired with child resistant caps for added protection, a range of regular caps for packaging non-toxic products, or shrink bands for tamper evidence. From plastic bottles to glass jars to metal tins, SKS offers an ever expanding range of bath and body care containers. Each line of bath containers is available in a variety of shapes, sizes, and colors and can be purchased with various cap options to fit your style and branding needs. PET Plastics are lightweight and durable. Their versatility allows them to be flexible in color and shape to meet almost any packaging requirement for immense marketing advantages. SKS Bottle carries a large selection of PET plastic colored bottles and jars in amber, blue, green, purple, black, and white. Each line of colored containers is available in a range of sizes and can be purchased with various cap options to fit your style and branding needs. 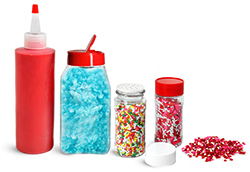 SKS Bottle carries a growing selection of glass and plastic spice bottles and spice jars. SKS Bottle carries a wide selection of glass and plastic honey bottles and jars for packaging flavored honey, spun honey, also called creamed honey, or raw honey, as well as different honey products. SKS Bottle carries a variety of bottles with tamper evident and/or child resistant caps in a range of sizes and styles that could be used for packaging and dispensing e-cigarette and personal vaporizer products. SKS Bottle strives to improve green practices through sustainable packaging. 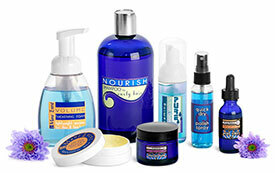 We carry a variety of eco-friendly bottles, jars, tubs, and tubes for cosmetic, beauty, and food packaging. 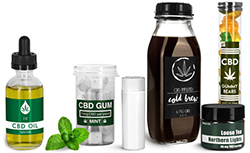 CBD is used to make a range of products, and SKS is pleased to provide a variety of packaging to suit your needs. 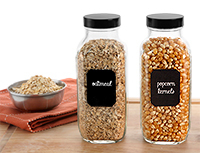 SKS Bottle & Packaging recently introduced a new custom mold 16 oz clear PET food jars! SKS offers a versatile inventory of glass and plastic, bottles and jars, to aid in the candy making process, and to package candy and other sweet treats! 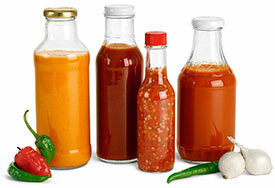 SKS Bottle & Packaging carries an extensive line of packaging for sauces, dressings, and various condiments. Whether you are in the market for glass or plastic sauce bottles, many unique styles and functional cap options are available. SKS Bottle & Packaging carries a variety of roll on bottles in both plastic and glass for products that require a more gradual application. Choose from the array of colors, sizes, finishes and caps offered to create your products custom look! SKS has a wide selection of glass and plastic containers to get started with meal preparation for any health and fitness routine. SKS Bottle & Packaging offers PET cosmo round bottles in many sizes, colors, and paired with a variety of caps to suit your needs. The wide variety of available colors and sizes make it easy to customize nearly any product line. Click to read more in our Newsletter! Fine mist sprayers are a great option for packaging low viscosity liquids that should be applied or dispensed by misting. SKS Bottle & Packaging carries a wide range of fine mist sprayers that could be used for packaging anything from body sprays to cleaning solutions. Click to read more in our Newsletter! SKS Bottle & Packaging has a wide variety of packaging options to house many pet care products. Whether looking for bottles, jars, or tins, there is sure to be an option for packaging grooming supplies, treats, foods, or health products. Click to read more in our Newsletter! Whether you are looking to produce batches of cold brew for a jumpstart at home or deciding to add this delicious drink to your product line, SKS has you covered. Click to read more in our Newsletter! SKS Bottle & Packaging carries a large selection of tamper evident packaging options from shrink bands to tamper evident caps. Tamper evident packaging allows customers to determine if a container has been opened, assuring that the product they are purchasing has not been altered in any way. A safety measure that is key when packaging products such as food, beverages, chemicals, or pharmaceuticals. Click to read more in our Newsletter! SKS Bottle & Packaging carries a growing line of plastic deodorant containers. There are a variety of colors and styles available for packaging deodorant, lotion bars, or solid perfumes. Click to read more in our Newsletter! SKS Bottle & Packaging carries an extensive line of candle containers. With candle packaging available in a variety of styles, sizes, and materials, you�re sure to find quality packaging that meets your needs at SKS! Click to read more in our Newsletter! SKS Bottle & Packaging offers PET boston rounds in an array of sizes and colors. Boston rounds can be paired with dispensing caps and non-dispensing caps, both available in ribbed or smooth to meet many different needs. Click to read more! 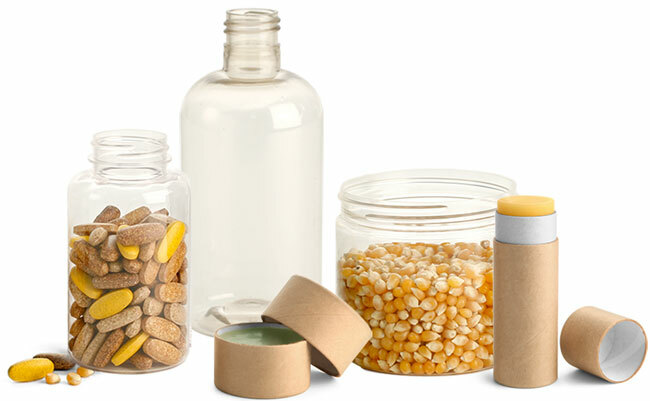 SKS Bottle and Packaging carries a wide variety of bottles and jars made of LDPE and HDPE, two popular packaging materials derived from polyethylene, a synthetic resin created from the polymerization of ethylene. Click below to read more about these two materials. Looking to increase customer appeal and add value to your product? Choose from one of the many deco options SKS Bottle & Packaging offers to enhance the appearance of your product packaging. Brand your product with a custom label, available in a wide variety of shapes and sizes, or opt for customized silk screening. SKS Bottle & Packaging offers a wide variety of bottles that can be used to package and dispense liquids. Whether looking for glass or plastic, SKS offers many containers to suit nearly every need. SKS Bottle & Packaging carries a large collection of bottles that could be used to package products for home distilling, fermenting, and brewing. SKS Bottle & Packaging carries a wide variety of amenity containers that could be used by a variety of industries to package hair care products, lotion, lip balms, and more. SKS Bottle & Packaging offers various styles, sizes, and colors of child resistant containers. Click to read more about these child resistant packaging options. Whether packaging soaps, creams, cosmetics, chemicals, or disinfectants - SKS Bottle & Packaging has pump options to fit many unique applications. Pumps are a versatile packaging option, so it is important to choose the appropriate one to dispense the product properly. Read more to find the best pump for your container. SKS Bottle & Packaging carries many styles and sizes of jars that could be used to can fruits, vegetables, red meats, poultry, pickles, and relishes. Unsure which packaging material will suit your needs? Glass may be the answer. SKS Bottle & Packaging stocks glass products in a range of colors, sizes and styles to accommodate a variety of industries. SKS carries products to serve a wide range of industries. More recently SKS has built off existing lines, as well as added new ones for products that suit the homebrew, fermentation and distilling industries. In 2015 SKS brought in over 200 new items to the ever-expanding online catalog! Let us take a look at some of the new products SKS has to offer. Look to SKS for a variety of lip balm packaging. With options ranging in size, shape, color, and material, there is sure to be an option that suits your needs. SKS has undergone big changes to the member's and payment area to make the ordering process easier for you! Let's walk through some of the updates and new changes. SKS stocks a variety of glass and plastic containers to package aromatherapy products. From dropper bottles to roll ons to cosmo rounds, these bottles suit an array of essential oil packaging needs. Not all caps or closures have the same lining so when packaging products it is important to know which cap liner suits the product packaging best. Click below to take a look at the different liners SKS has to offer for your packaging solutions. In 2014 SKS brought in around 150 new bulk stock items to the ever-expanding online catalog! Click to read about these new products from 2014! Going "green" is a goal that SKS Bottle and Packaging, Inc. is always striving to meet and strongly takes into account as the company continues to grow. SKS stocks a range of options when it comes to industrial containers. With our extensive online catalog easily shop the variety of chemical and industrial containers to find just what you're looking for. Last year SKS designed a customizable bottle on Thingiverse allowing anyone to be able to design their own bottle. There have been 90 "remixes" or variations created from our customizable bottle. 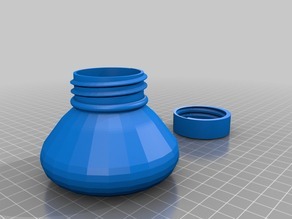 Read more to see a selection of remixes that have been created and check out all other remixes by visiting Thingiverse and try creating your own bottle! There are several things you should take into consideration when choosing the most suitable plastic packaging material for your product. Click to read more and find out which plastic container may be the best solution for your products! Looking for a deal? Browse SKS' Closeout and Special pages. The Closeout page is full of discontinued quality products that are offered at extremely low prices. The specials page contains products that are offered at a temporarily lowered price. Check out some of these products! SKS always has strived for innovation in packaging. We offer a variety of shapes, styles, and materials to suit every customer's needs. We are no stranger to developing a product from start to finish. We take pride in our products and welcome you to learn about what happens behind the design of some everyday objects. In 2013 SKS added over 160 new stocked bulk items to the web. Check out some of these new products, find exciting & creative ways to use packaging, and see our product of the month. Here at SKS Bottle and Packaging we offer a wide variety of spice container options to suit most any of your packaging and dispensing needs. Click below for more details. Spring of 2013, we take a look at color and its influence on choice. In 2012, we expanded our inventory to include some great new products such as custom labels and eco-friendly containers made form PIR, paperboard and PCR plastic. From fragrances to foundation and everything in between, SKS offers a wide variety of packaging for your cosmetics product line. 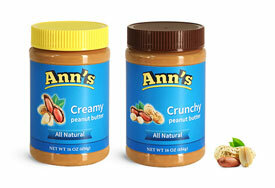 SKS is excited about the next big thing in green packaging! Bringing in packaging made of PIR, PCR and paperboard is our way of taking steps toward helping our environment. SKS carries an extensive collection of chemical and industrial containers. Whether you need a lightweight plastic jug or a durable glass jar, we have the products you'll need for storing and dispensing many chemical and industrial products. Whether you need to package inks, ointments, cleansing solution or more, you could find the perfect container here. Check out SKS's full line of tattoo and piercing containers. Whether you need to package pills, liquids, oils or other supplements, you could find the perfect container here! Explore SKS's large selection of nutritional supplement containers. Whether you're looking to package honey sauces, beeswax candles or a honey skin care line, SKS has a great selection of beekeeping containers for all of your apiary, beeswax and honey products! SKS carries an extensive selection of spa and salon containers for your hair care, skin care, massage or tanning product line. SKS offers a great selection of gardening ideas, supplies and accessories for indoor and outdoor gardens. From first time gardeners to those with green thumbs, SKS may have just what you need for your next planting project! Our assortment of CD cases, tins and accessories could be ideal for a variety of media packaging needs from protecting music and movies to storing headphones and USB cords.